This small yellow morel appears to be widely distributed and common in eastern North America from about the Great Lakes southward. 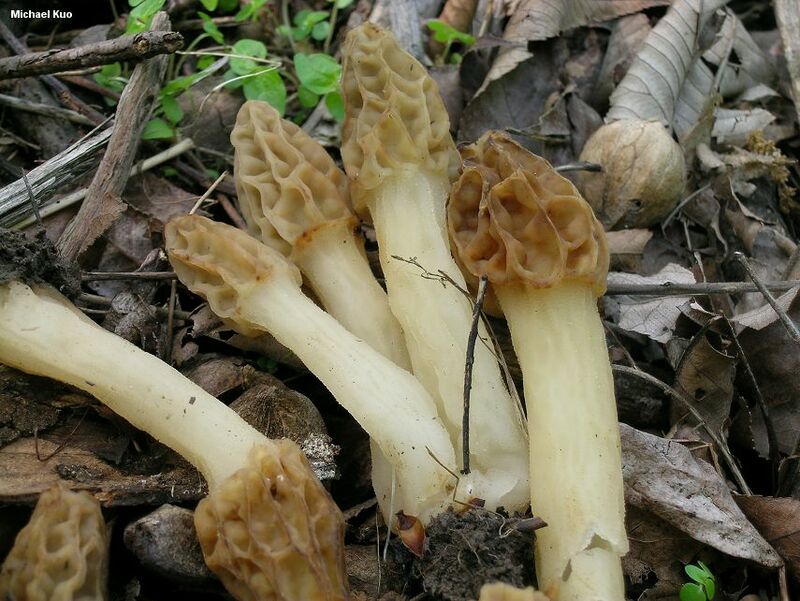 Like other yellow morels it features ridges that do not darken to brown or black with maturity, and a cap that attaches to the stem without much of a groove. 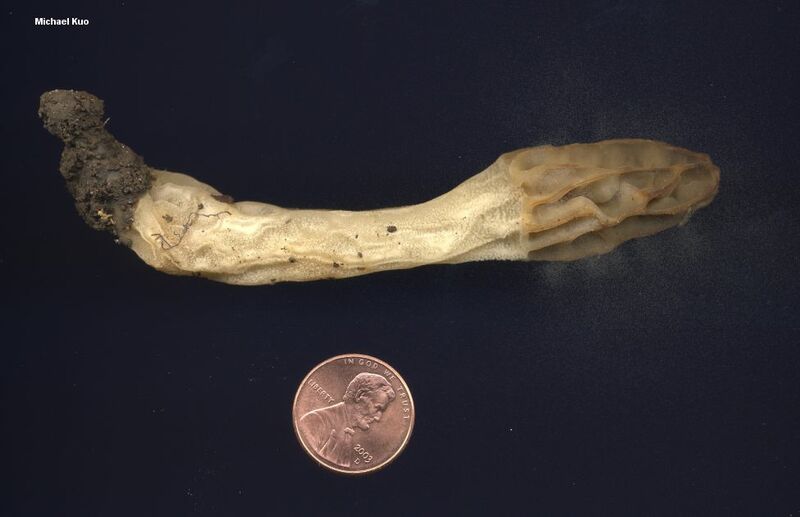 Features that distinguish Morchella diminutiva from other yellow morels include its small size; the sparse, vertical arrangement of the pits and ridges; the usually pointed cap; and the frequently long and skinny stem. Morchella diminutiva is fond of white ash, green ash, tulip trees, and hickories--although it can also be found under oaks and other hardwoods. 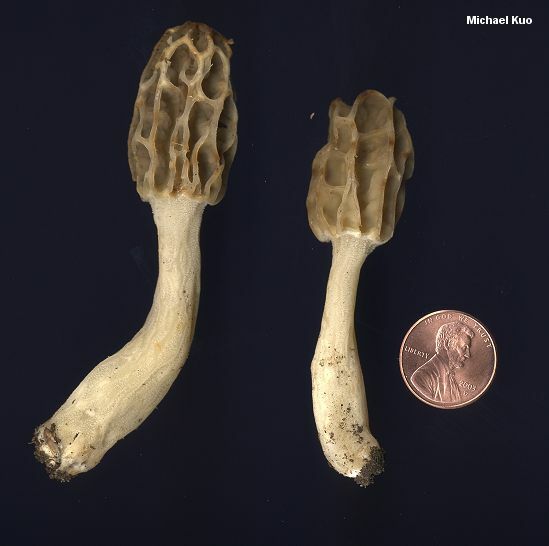 Its closest look-alike, Morchella virginiana, is usually larger and more egg-shaped--and appears to be exclusively associated with tulip trees in the southeastern United States. Occasional aberrant specimens of Morchella diminutiva can look a lot like Morchella esculentoides (see this collection, for example), when the cap is less conical and the arrangement of the pits and ridges is less clearly sparse and vertical. Ecology: Possibly saprobic and mycorrhizal at different points in its life cycle; growing alone, scattered, or gregariously under hardwoods, including white ash, green ash, tulip trees, and hickories; April and May; widely distributed and common east of the Great Plains and below the Great Lakes. Cap: 2-4 cm tall and 1-3 cm wide; conical or nearly so (rarely egg-shaped, or cylindric); pitted and ridged, with the pits primarily arranged vertically; when young with yellowish, rounded to flat, bald ridges and medium to dark gray pits; when mature with sharpened or eroded, brownish yellow to yellowish brown ridges and similarly colored pits; attached to the stem directly, without a groove; hollow. Stem: 1-7 cm high and 0.5-1.5 cm wide; more or less equal, or sometimes a little swollen at the base; whitish; bald or finely mealy with granules; hollow. Microscopic Features: Spores (18-) 20-24 (-26) x (10-) 11-16 (-18) µ; smooth; elliptical; without oil droplets; contents homogeneous. Asci 8-spored. 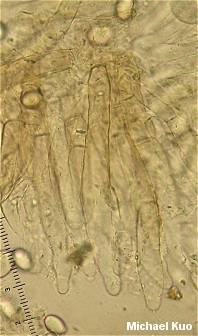 Paraphyses cylindric with variable apices; septate; hyaline to brown in KOH. Elements on sterile ridges 75-175 x 10-30 µ; septate; hyaline to brownish or brown in KOH; terminal cell usually subfusiform. SPECIMENS EXAMINED: Herb. F. 04079501, 04189503, 04179802, 04200201, 04010302, 04130301, 04190302, 04240301, 05010303, 05040301, 05080301, 05080304, 04010401,04070403,04080401, 04080402, 04160401, 04160402, 04280402, 04280404, 04290401, 04300405, 05010403, 05010404, 05020404, 05030402, 05030403, 05030404 (holotype), 05010502, 05030502, 05070501. Kuo, M. (2012, November). 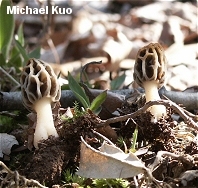 Morchella diminutiva. Retrieved from the MushroomExpert.Com Web site: http://www.mushroomexpert.com/morchella_diminutiva.html.